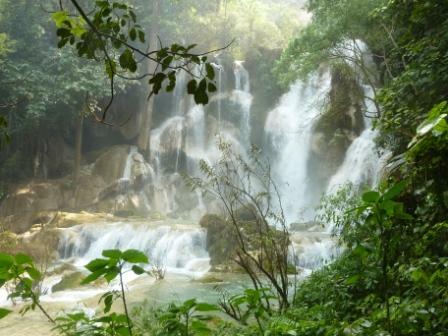 Leaving Chiang Mai, I was faced with a choice as to how best to travel to my next destination… Luang Prabang, Laos. I could take an 8 hour bus to the border, which is delineated by the mighty Mekong River in these parts, catch a water taxi across and into Laos to clear customs and then, the following morning, climb aboard what sounds to be a very uncomfortable, and often painfully overcrowded, slow boat down the Mekong for two days with an overnight in a small riverside town offering what are reported to be some of the most rat/lice/bedbug infested guesthouses in the country. Or, I could hop an hour long Lao Airlines flight for about $120 and save the three days of potentially painful travel. Easy call, right? It was actually a bit more difficult of a decision owing to some sort of romantic notion I have of lazily drifting down the Mekong like a moyen de fortune plying his services during the latter days of the French colonial regime when boat travel was often the best, and sometimes the only, option in a country severely lacking in roads until fairly recently… and even today many of the roads are nothing more than single lanes of rutted up dirt and dust, if you’re lucky enough to be traveling in the dry season, or mud and more mud if you’re not. It is supposed to be a fairly scenic stretch of the Mekong from the border town of Huay Xi to Luang Prabang and, provided you score a decent seat with a little distance from the roving herds of lager lout backpackers known to frequent these boats and pack a good book, it could make for an enjoyable trip. I came close to opting for that mode of travel. But Lao Airlines won out in the end, my reasoning being that I would certainly have other opportunities to travel by boat on the Mekong, whether in Laos, Cambodia or Vietnam. As it turned out, the scenery coming in on the plane was rather spectacular in its own right particularly once the Mekong came into view. There’s really no mistaking that muddy snake of a river after having seen it in so many films. And since Lao Airlines uses small prop planes on this route, we were flying lower than we otherwise would have been on a typical commercial flight thus making the view even better. The rich green tree covered mountains outside of town looked almost fake when viewed from above… like those of an elaborate scale model. Having landed, I reluctantly complied with the policy posted over the customs desk stating that bare chests and bikini tops are strictly forbidden when processing through the Lao immigration queue and was thus quickly en route to my guesthouse. After checking in to my villa (which sounds much more fancified French than it is as almost every guesthouse refers to itself as a villa in this town), I strolled the half block down to the riverside trying not to interrupt several games of street badminton and posted up at an outdoor cafe under a few magnificent old trees (which this town is holding in spades) to enjoy the sunset with a cold Beer Lao. 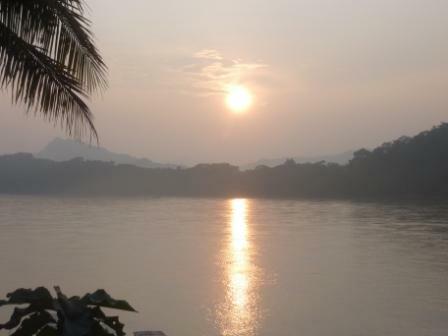 The sleepy yet steady flow of the river is utterly hypnotic at that time of day which probably explains why I spent almost every sunset of my stay in Luang Prabang similarly situated as the sun slowly dropped behind the mountains and low laying clouds on the opposite side of the river. 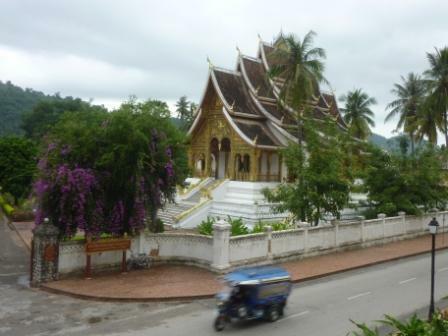 Luang Prabang is fantastic and, in many ways, it would seem to be the quintessential SE Asian town. It is located on the Mekong and any number of interesting old boats ply the waters nearby. It is brimming with both colonial era architecture and wats, the latter of which accounts for the large number of Buddhist novices and monks strolling about town in their orange robes. It is also home to a good night market and loads of tasty street food. And, last but not least, it is malarial. It is also sleepier and more relaxed than any other sizable city that I have visited on this trip. Buses are banned from the old town and that certainly helps. In addition, there are far more people riding bicycles here than in Thailand where virtually everyone was on a motorbike. There is also an 11:30 curfew and almost nothing in the way of nightlife, at least not in the old town. Best of all, there are far fewer touts here and the tuk tuk drivers are much less hawkish in offering their services. Combine all of that with the generally laid back attitude of the Lao people and the calming effect of the river and you have one wonderfully mellow town. 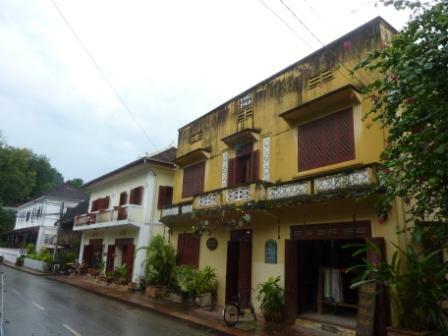 I spent most of my days in Luang Prabang aimlessly exploring the old town by foot and bicycle and just enjoying the ambience of the place. As mentioned above, there are quite a few beautifully aged buildings that were built by the French and date back to the early 1900s when they were running the show here. 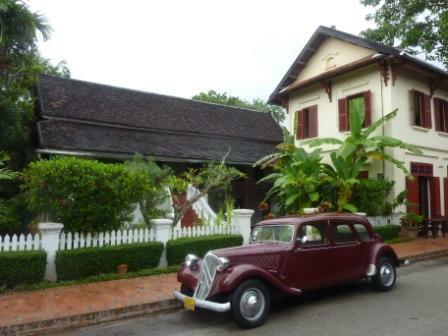 Why is it that French colonial architecture seems to be at its best after a century or so of tropical weathering? 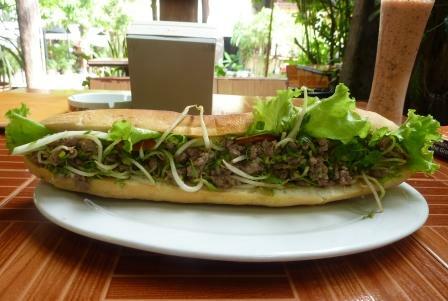 They also left an appreciation for good coffee and proper baked goods and Luang Prabang has plenty of both and I made a point of enjoying them to the fullest including a lovely water buffalo baguette. In order to unwind from the tremendously stressful pace of life in Luang Prabang, I went for a Lao massage or two while in town prior to which I had no idea as to how exactly it differed from Thai massage. I was given the same type of MC Hammer pants I had been given in Bangkok for my Thai massage. But I was also given a cool looking kung fu top with a banded collar and that alone would seem to make it the superior of the two forms of massage. Properly attired, I was then properly tuned up by my masseuse via her knees and elbows some of which would certainly have been scoring strikes in a Muay Thai match. It’s my understanding that Thai and Lao massage are “same, same but different” (and if you’ve ever been to this part of the world you’ll know that that phrase is a favorite for describing any number of things). In other words, they are similar with some variations. In my limited experience, Lao massage seems to differ in being more forceful and using the knees and elbows even more liberally than Thai massage while Thai massage seems to involve a bit more of a stretching component. That being said, my sample size for drawing these conclusions is very limited at this point. However, I hereby promise that I shall selflessly strive to increase that size solely for the sake of you, my dear readers. One other difference: the Lao massage sometimes ends with an optional session in an herbal sauna which was great except for the fact that the weather outside of the sauna isn’t that much different than the weather inside the sauna and thus cooling down afterward is no easy feat. As intense as the massage itself was, I felt fantastic after it was over… and after I had spent a good half hour blasting myself with the AC unit in my guesthouse and pounding a liter of icy cold water. 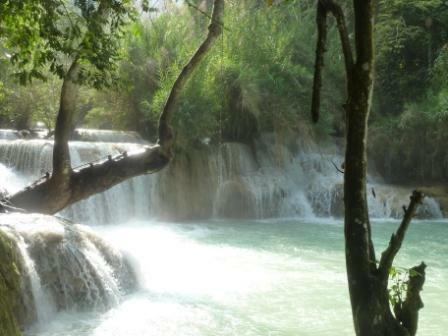 I pried myself away from the tranquillity of the city for a day trip to the Kuang Si waterfalls. It was good fun as there were ample opportunities for swimming in the cool turquoise waters of the multiple swimming holes situated below the main falls. If only they’d had a swimming hole outside of the Lao sauna I visited. 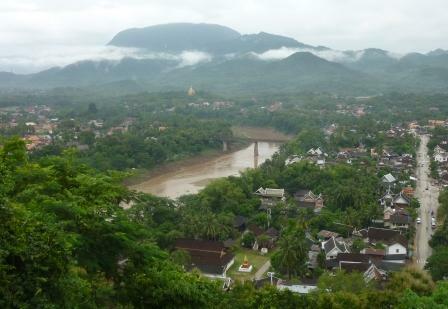 I spent 5 excellent days in Luang Prabang during which I devoted a decent amount of time to trying to figure out if there would be a boat heading upriver to a town called Nong Khiaw anytime soon. I received a different answer virtually every time I asked the question. It eventually became apparent that the only way to find out if a boat were headed north on a given morning was to drag yourself and your bags down to one of the docks (which had no indication that it was the embarkation point for boats headed to Nong Khiaw and other points north in any language other than Lao), put your name on a list, hope that enough other people were similarly inclined and then wait and see if a boat goes. If there aren’t enough people to make it worth the boatman’s effort then there would be no boat. I suspect that if the boatmen drank a little too much Lao whiskey the evening prior, there would also be no boat. I lucked out on both accounts and we had more than enough with 9 of us motoring out on a small rickety boat with only 6 seats and 5 life jackets. Next stop… a wiz break on a sandbar 4 hours upriver. Next stop after that… Nong Khiaw.